Theatrically there is style sewn throughout Red Sparrow, but at times, it simply needed more. The world of espionage is a never-ending game of cat and mouse. Countries spying on each other in an attempt to find out their dirty little secrets. Agents all over the world working with and against each other simply to get the upper hand. While most of us live in ignorant bliss and think these dealings only happen in the movies, author Jason Matthews knows differently. After 20 plus years working for the Central Intelligence Agency, he left and began writing novels based on this former life. Before the book was even finished, Red Sparrow was already making the rounds in Hollywood and earlier this year it was released in theaters. Now, it is heading to stores on 4K UHD, Blu-ray, and DVD. Dominika Egorova (Jennifer Lawrence; Silver Linings Playbook) was a featured ballerina with the Bolshoi Ballet until a terrible accident ended her dance career. Caring for her crippled mother, she is desperate to stay in the good graces of Mother Russia. When her uncle, Vanya Egorov (Matthias Shoenaerts; The Danish Girl) offers to help her and her mother and only asks for a favor, she is hesitant but agrees. Dominika is sent to lure a wealthy businessman to her room so information can be extracted from him but when he is killed in front of her instead she is given two choices - be eliminated or join the Sparrow program. Sparrows are operatives who are trained to get to know their targets and do what is necessary to get information. As a Sparrow, Dominika is sent to Budapest to make contact with a CIA agent named Nate Nash (Joel Edgerton; Black Mass) and find out the name of the Russian mole he was working with. Instead, she works as a double agent with Nash to try and get out of Russia. Ironically, in the end, she supposedly gets the name of the mole and returns to Russia as a hero. In general, I like Lawrence but she is poorly cast in the lead role. She is not believable as either a prima ballerina nor a Russian. It's a distraction that takes the viewer out of the story time and time again. Edgerton, on the other hand, is excellent as the rough around the edges CIA agent with an unusually kind heart for someone in the spy business. Shoenaert plays the creepy and unlikable uncle perfectly that he makes your skin crawl with almost every sentence he utters. Jeremy Irons (Batman v Superman: Dawn of Justice) as General Korchnoi is underutilized. The 4K presentation is excellent with 2160p video quality. The red of Dominika's tutu and pointe shoes are bold and brilliant in contrast with the drab tones of the Sparrow school uniforms and the scenery and costumes of Budapest. The Dolby Digital 5.1 audio showcases the haunting soundtrack nicely. As we hear the same piece of orchestration repeatedly, it is easy to discern the deep bass tones from the lighter woodwinds. The dialogue and sound effects are mixed well with one not overpowering the other. The combo pack has a decent amount of extras, though some are more interesting than others. Besides the Digital download, they include: Cold War: Origination and Adaptation, Agents Provocateurs: The Ensemble Cast, Tradecraft: Visual Authenticity, Heart of the Tempest: On Location, Welcome to Sparrow School: Ballet and Stunts, A Puzzle of Need: Post-Production, Director Commentary by Francis Lawrence, and 10 Deleted Scenes (With Optional Commentary by Francis Lawrence). As a basic concept, Red Sparrow is nothing especially new but it had the potential for being a very good film. Unfortunately, the plot and characters are too superficial and the depth of a great plot and character development is missing. There is graphic violence and overtly sexual moments that I'm not sure are necessary. Theatrically, there is style sewn throughout Red Sparrow, but at times, it simply needed more. 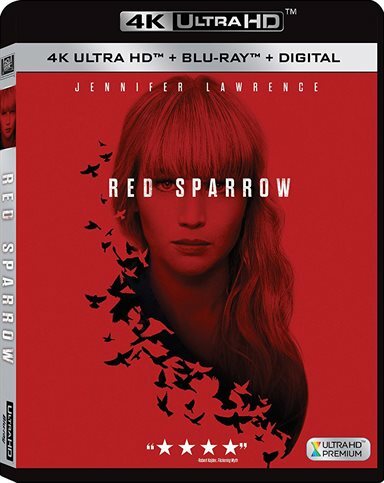 Download Red Sparrow from the iTunes Store in Digial HD. For more information about Red Sparrow visit the FlickDirect Movie Database.